PENDING ESCROW. 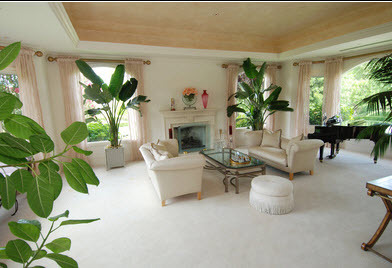 Contemporary Mediterranean home of approximately 10,500 sq. 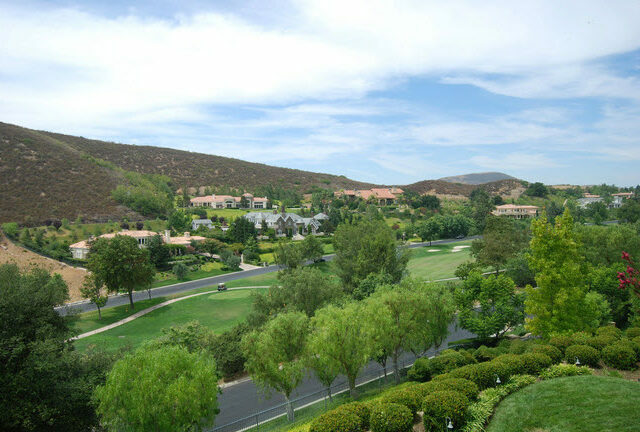 ft. in the 24 hour guard gated Club Estates is privately gated on 2.33 manicured acres. Port a cachere with interlocking paver drive features a cascading waterfall with an iron arbor backdrop and sculpture in the outdoor fountain. Leaded, glass arched beveled doors open into an awe inspiring residence with a perfect open floor plan features generously scaled rooms with expansive windows and ceilings. The architecturally stunning foyer with Travertine and marble bordered, lit dome and floating staircase with beveled windows leads you into this sophisticated living room with lit ceiling, expansive picture windows and Venetian plaster. 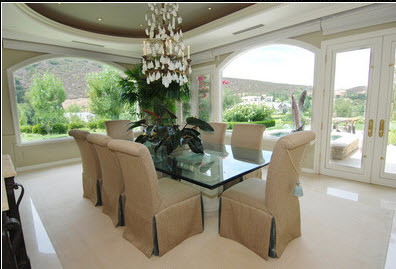 Step down formal dining room with marble bordering carpet, spectacular views and French doors leading to private patio and rear yard. Powder room with gold leaf porcelain sink, Murano chandelier and padded silk walls. 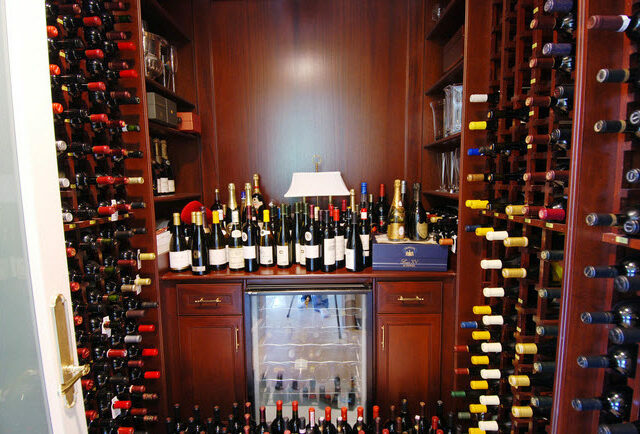 Temperature controlled wine room with refrigerator houses approximately 600 bottles of wine. 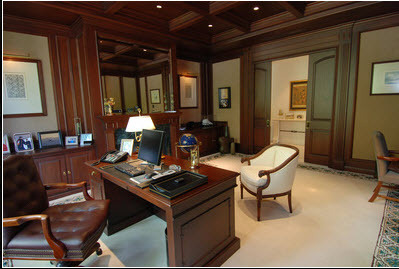 Executive library with fireplace, suede walls, embroidered bordered carpeting, T V and built in desk. 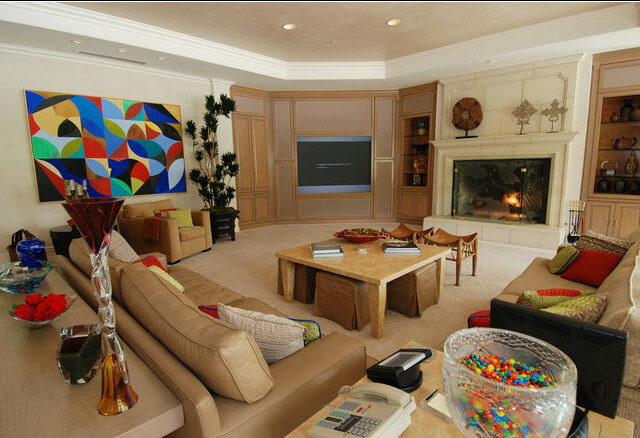 Relax and entertain in the oversized family/great room. 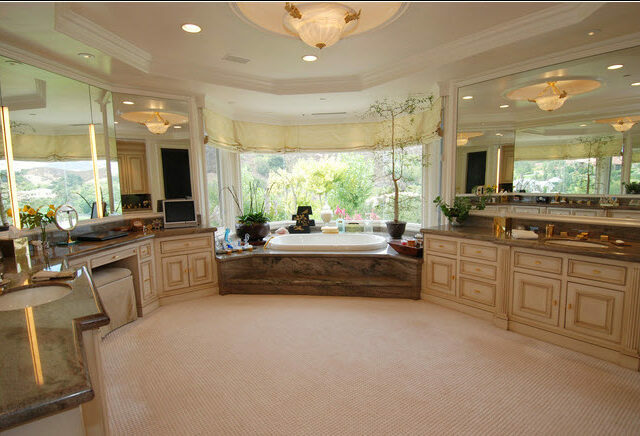 Circular wet bar with beer tap, ice machine, refrigerator and trash compactor. 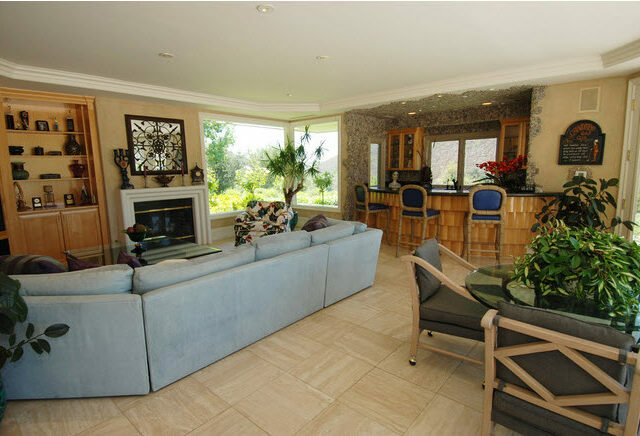 Also featured is built in Creston TV system, speakers, fireplace with Ultra glass screen and built in cabinets. Game vestibule with mitered glass. This room was designed to also accommodate a pool table. Gourmet’s double island kitchen with Gaggenau double ovens, two microwaves, two Thermador warming drawers, six burner Gaggenau with Brew matic built in coffer maker, two Bosch dishwashers; one at butler’s pantry, two trash compactors and ice machine. Two SubZero refrigerators with freezer drawers below. Charming oval breakfast room with arched entry, French doors to yard and mitered glass windows optimizing the gorgeous views. Formal Dining room designed to enjoy the artistic fountain and views; shade control on window, temperature controlled wine room will house over 500 bottles of your finest. Luxurious master suite with mitered glass wall and oversized balcony to enjoy privacy and views. Shade control on windows. Master bath with two huge closets with etched glass skylights, tri-view wardrobe mirrors, Toto toilets with Neo Rest controls, two steam showers with etched glass, coffee station and inviting spa tub. Additionally, there are Four Ensuites; three upstairs and one on the first floor. 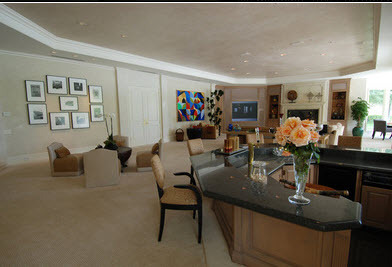 All suites feature Carerra marble baths, walk in closets with built ins. There are Two laundry rooms, one on each floor for convenience. Magnificent sky lit landing with a special alcove at the top of stairway for reading, viewing and private moments. 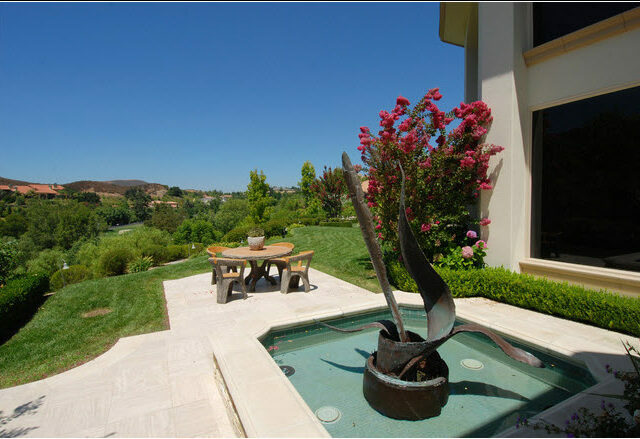 Amazing entertainer’s yard with 2.33 manicured acres welcome you to the refreshing all tiled pool and raised spa. All patios and walkways are covered with Travertine. Granite island Barbeque center with sink and seating for seven with built in heaters. Guest house/cabana features textured concrete walls with rock accents, mitered glass windows, two sets of French doors, fireplace, TV, built-ins and bar with Bosch dishwasher, trash compactor, sink, microwave and ice maker. 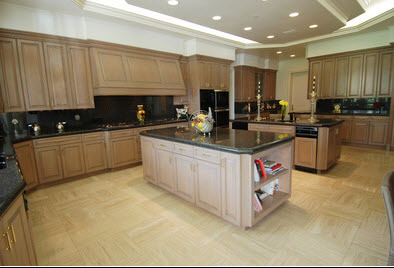 Four car garage with epoxy floors and built in storage ~ Basketball court ~ 10 HVAC Units. Electronically, this property is state of the art. Lutron lighting and Creston total home technology systems at entry and in each bedroom for A/C, lights, security and fountains. The ultimate location in an extraordinary residential community with amazing mountain and golf course views!